Spring is finally here in Illinois, we think. Winter weather is finally breaking its grip on us, and now begins the many rituals of gardening, lawn care and cooking outside on the grill. We are all aware of keeping our outdoor cooking devices away from materials that will burn, like our houses. We all should also know that vinyl siding is basically a solid form of oil that hangs horizontally on our home and burns nearly as hot and fast as gasoline when ignited. So we keep the grill away from the house, the lawn furniture, and we don’t place it under an overhang, or on a wooden porch or desk, we keep the kids from bumping into it, and we never leave our barbeque grills unattended while the gas or charcoal is producing copious amounts of heat and flames right next to the biggest and most important investment of our lives. 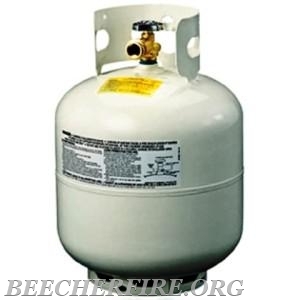 Since we are safe using our grills and other propane appliances, let’s talk about where and how we store this equipment and its propane bottles. First, some properties we need to know: Propane is heavier than air, so it will settle into low areas if released. A typical propane grill utilizes a 20 pound bottle, which holds about 4 gallons of liquid propane when full. Propane is stored as a liquid, but used as a vapor. The amount of vapor capable of being produced is 270 times the amount of liquid, so the 20 pound bottle can produce roughly 1,100 gallons of vapor. The liquid evaporates to vapor at minus 44 degrees. Nearly any time the liquid escapes it will evaporate into gas. The flash point- the temperature the gas will flash if a spark comes into contact with it- is minus 156 degrees. Also, it will self-ignite at 900 degrees above zero, meaning there does not have to be any ignitions source available. When the gas burns it produces a flame reaching 2,000 degrees. Paper and wood burn at 450 degrees, and rigid vinyl siding burns between 750 and 850 degrees. What are the dangers when we consider the properties of propane? Well, if we store propane in our house, basement, or inside the attached garage, and there is a problem with a leak or the valve not being shut all the way off, a typical grill bottle will emit enough ignitable vapor to fill a 24 by 36 space, a typical 2 ½ car garage, or a basement of a 1,000 square foot house. When a fire is showing a yellow flame, it is producing a temperature of around 2,000 degrees. So anything producing this type of flame from a match, a pilot light, or a spark from an exhaust can ignite the vapors. If this happens the fire will fill the size of the area the vapor has filled. Propane burns at temperatures of 3,500 degrees, so pretty much anything around it will be ignited also, including some metals, not to mention wood, paper and vinyl siding, all of which have a much lower ignition temperature. Human error is usually prevalent when an accident occurs. Propane is common and safe to use as long as we do not get complacent and forgetful of what can occur if released incorrectly. Sometimes we forget because nothing has ever happened and we believe it will never happen to us. But we must realize if we are not careful storing and using propane, it can happen to us, and never in a small way.